The following were the TNSAR trainings for the 2010 - 2011 season. Come enjoy the fall colors as we explore the boundary of Squaw Valley. The focus will be on the terrain between the top tram and Shirley Canyon where we have had searches in the past. Come out and enjoy a fun day in the mountains. Terrain familiarization of the Coldstream area. We had several searches in this area last year and it will be good to see it without snow and evaluate the terrain during the daytime. The riding is generally very easy and double track. There is one short section of single track that leads to a very scenic lookout and the single track is 95% easy with 5% moderate. We have received quite a bit of rain recently and the ground is pretty much dust free.
" A Merging of Theory and Practice" ISSW is October 17-22 at the Resort at Squaw Creek. Go to website to register:http://www.issw2010.com/. Bernie will lead us on a fall hike of the Powderhorn Creek area. Come for the fun, come for the fall colors. Map and Compass training at the KB Fire Department, 6:30-8pm. Important skills to brush up on every year, Randall will take us through the basics and teach us skills to use in the backcountry. His presentation is here. Come hang out with Geoff as we explore the Deep Creek Drainage. Expect a full day of hiking with a accent of Billy's Peak on the Sierra Crest. Call Geoff with questions and to let him know you are coming. This is a great opportunity to hone rock craft skills that translate into climbing, mountaineering and rescue scenarios. We will examine a wide variety of gear placements and methods for crafting secure and reliable anchors. Working and playing in small groups, the day will be filled with a mix of technical skill building and recreational climbing. Most gear will be supplied. Bring your harness and climbing shoes (and rope if you have one). Join Doug for an adventure on the East Shore of Lake Tahoe exploring the Snow Valley Peak area. Contact Doug beforehand to see if we will be in hiking boots or skis or a combination of both. If the Snow Gods produce what is promised we will be skiing by Thanksgiving. Sara will lead a tour of the Deep Creek Peak area hopefully accessing some good early season powder. Make sure to call ahead of time to make sure the Snow Gods make good on their offerings. Register online. 3-9pm. Sign up by November 27, 2010 or you may call the Tahoe Center for Health & Sports Performance at (530) 587-3769 for more information regarding this course. The $20 reg fee will be refunded by the Team when you show up for the conference. Explore the complex terrain of the Mt. Rose backcountry. This will be primarily ski touring for intermediate/advanced abilities. Always call ahead for meet up and trailhead information. Joint training with all team members and abilities welcome. HOT LUNCH will be served! In case you are not aware Snowmo's need to stage elsewhere. Looking for skiers and snowmobilers to reenact the search for the lost snowshoers on X-Mas. This will be great terrain familiarization and search practice. Open to all team skiers and snowmobiliers. Call Dirk for details. Come one come all. We will be training the first weekend of January. Stay tuned for all the details, Russ promises powder, views and great memories. Integrated avalanche training with hosted by Mt rose ski patrol and northlake tahoe fire. Sessions will be on the 18th, 20th, and 21st at 10 am and 1 pm however Devin will be available only at select times. We will be skiing at Homewood and enjoying the sidecountry out of the resort. Ellis Peak is always a favorite. Smile your at Homewood. Winter backcountry navigation and route-finding, snow shelter construction and occupation overnight. Snow camping techniques. Come join Sara for a great day utilizing all the toys. We will be working on towing skiers, skiing powder and some joint rescue coordination. Make sure to call Sara to confirm before training. Northstar training day, be there or be square. We will be exploring the Northstar boundary and beyond and checking out the normal exit points that have led to past searches. Make sure to RSVP with Paul so he can arrange for your lift ticket-advanced notice is required if you plan on attending. The team will be hosting a private L2 avy course 2/24-2/27. Plan on 4 straight days, 8-5pm. You must reserve your spot to take part on this training. More details on the team forum. Come learn the new up to date techniques for avalanche rescue. We will be training at and near the team garage. Bring all your normal search gear. Bob will be leading us on a night search training outside of Sugar Bowl. This will be great practice for aspiring A team or current A team members. We will be going over normal search techniques and protocols. POSTPONED DUE TO WEATHER!!!! WILL BE RESCHEDULED.This training will take us up Grouse Ridge and down to Diamond Crossing. On the way we'll familiarize ourselves with our new Brooks Range Eskimo sleds and then rendevous with Careflight, at which point we will cover helicopter protocols and how to manage a helicopter LZ. Pack an extra bologna sandwich. This will be a big day. POSTPONED FOR A LATER DATE. 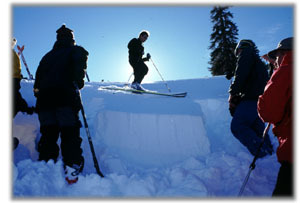 We will be exploring Squaw's terrain and out of bounds terrain, a training not to be missed. Must call Peter and confirm your spot ahead of time if you are going to attend. This is a great opportunity to hone skills that translate into climbing, mountaineering and rescue scenarios. We will examine a variety of gear placements and methods for crafting secure and reliable anchors. Most gear will be supplied. Bring your harness and rope if you have one. This training will take us up Summit Chair and down to Diamond Crossing. On the way we'll familiarize ourselves with our new Brooks Range Eskimo sleds and then rendevous with Careflight, at which point we will cover helicopter protocols and how to manage a helicopter LZ. Pack an extra roast beef sandwich. This will be a big day. GPS refresher, 3x Waypoint ride. What to Bring: Search Ready Bike/OHV (including functioning headlight, not a flashlight taped to your helmet), SAR Pack/Gear, Radio Etc. Pack a lunch and enough water for the entire day. What to Expect: Water crossings, single track, RxR tunnels, skill development sections, SAR scenarios, GPS skill development, team work, epic scenery, views, fun and adventure.